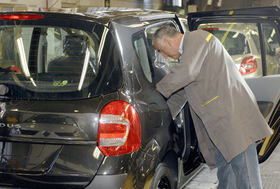 Renault wants state aid to replace Modus production at Valladolid with a new model. BARCELONA -- Renault says it could close its under-used factory in Valladolid, near Madrid, unless the Spanish government provides financial aid to help it build a new model in the plant. The French carmaker is considering building a small electric vehicle or a small diesel or gasoline car at Valladolid to replace the slow-selling Modus small minivan. But it says it cannot guarantee the factory's future without state help. Renault is asking Spain's government for low-interest loans and tax breaks to help make the factory competitive, Jean-Pierre Laurent, head of Renault's Spanish operations, said. "We are talking about a future-oriented competitiveness plan to help us through the crisis and to ensure that we don't close the factory," Laurent told Automotive News Europe during an interview at the Barcelona auto show. Laurent met Spanish Prime Minister Jose Luis Rodriguez Zapatero and Industry Minister Miguel Sebastian in Madrid last week to discuss the future of Valladolid, which is operating at about a third of its installed capacity. Laurent told Zapatero that public funds could persuade Renault to bring a new car, a new engine or both to the factory. "We have to ensure that Valladolid is competitive with other Renault factories," Laurent said. "To get there, we are going to need assistance from the national government, as well as from the regional government of Castile and Leon." Valladolid has been on a downward slide for the past five years after Renault shifted a portion of production of its top-selling Clio to factories in France, Slovenia and Turkey. In 2008, Valladolid built 93,150 cars, of which 72,590 were Modus models and 20,560 Clios. Engine production fell to 982,332 last year from 1.1 million in 2007. Between 1999 and 2003, when it last operated at full capacity, the factory built about 280,000 Clios and more than 1 million engines annually. Unions representing Valladolid's 3,900 workers fear that the factory will close unless Modus production is replaced with a new vehicle. Laurent said Renault is now considering building a small electric vehicle or a small diesel or gasoline car at Valladolid. Either car would likely be based on the platform already used for the Clio and Modus, Laurent said. Renault is also considering building a new engine at the factory. "We won't be able to maintain employment at Valladolid without these new projects, and we won't be able to do the projects without a new competitiveness plan from the government," Laurent said.